It was kind of remarkable to see Apple taking what some would call the “low road,” and actually comparing their product to that of the competition in such unkind terms. It’s the first time that Apple has really taken the trash-talking to this level – at least in recent years. 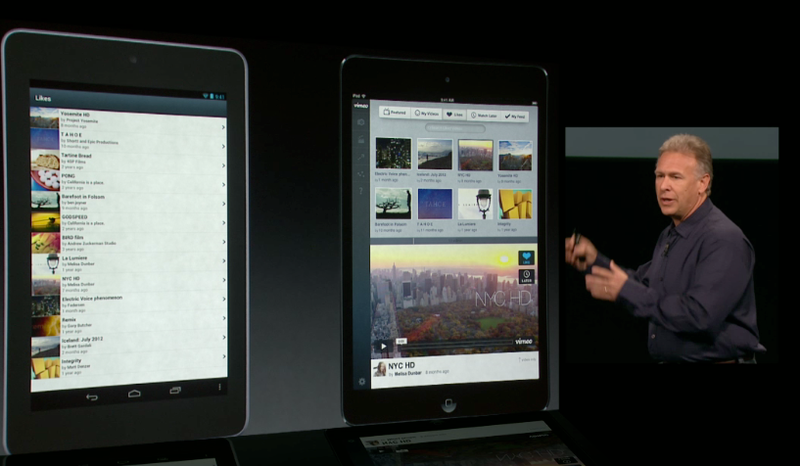 On the screen behind Schiller, the iPad Mini was shown next to a Nexus 7, although Schiller never referred to it by name. He stated that when you’re web surfing, you can see 49% more content because there are no on-screen controls with the iPad Mini. 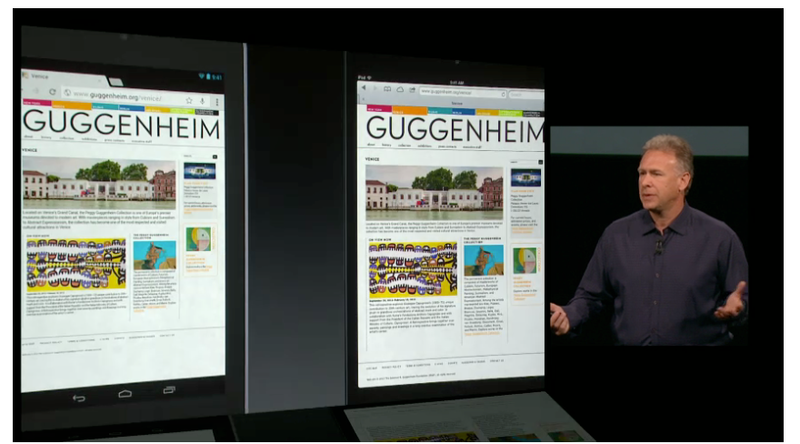 The screenshot showed the Guggenheim website in portrait mode. In landscape mode, the iPad offered 67% more content, Schiller said. But in the comparison, the Android tablet is not shown running a browser in full screen mode. Schiller also said the iPad’s bezel is aluminum and “theirs” is plastic and thicker. “In fact, the entire Android product is thicker and heavier than iPad Mini even though it has a smaller display,” Schiller commented. He points out that in terms of overall display the iPad Mini is 29.6″ versus the 21.9″ for the Nexus 7. The iPad Mini is 35% larger, he said. Notably, Schiller does not do side-by-side shots of Apple versus Google Maps. Go figure.